OOH FANCY THAT: .. restaurant review | mrs. knott's chicken dinner ..
.. restaurant review | mrs. knott's chicken dinner ..
Don't we all sometimes just crave some good fried chicken?? I certainly do, but have found it pretty difficult to come by, here in Southern California. That's a shame, really. I visited Mrs. Knott's last week, with a hankering for some good old southern food. Just by chance, none of us had had breakfast that day, so we were starving by the afternoon. In terms of filling our bellies, this place certainly delivered. We all had some slight problems walking after the meal, but I wouldn't say it was top notch fare. The traditional chicken dinners are a great deal ($15.95, I believe) and come with biscuits, salad, soup, four pieces of fried chicken, two sides, and a dessert. Because of our overwhelming hunger, we inhaled the biscuits, and I did enjoy them with the butter and jam. They do have a strange aftertaste though, a bit gritty and raw. I really liked my caesar salad, mostly for the extra creamy caesar dressing. The chicken soup was super hearty, and tasted just like chicken and dumplings minus the dumplings. Yum. At this point, I was pretty full, but hadn't yet had my chicken, so I forged ahead. The chicken was a tad disappointing, because I was envisioning this amazing piece of juicy, flavorful meat with a crisy, decadent crust, but I didn't really get that. 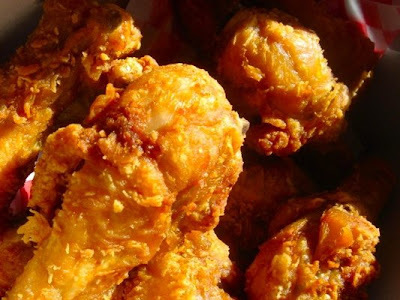 Maybe fried chicken is better in theory than it is in reality. The chicken just wasn't that flavorful, but it wasn't bad. My quest for fried chicken continues. There was a big to-do about how Walter Knott was the first to commercially cultivate the boysenberry (combination of rasberry, blackberry, and loganberry), which is cool, but I think I'd rather just have my regular old berries in pie. The boysenberry pie was full of large seeds, and it was really sour, more of an acquired taste.